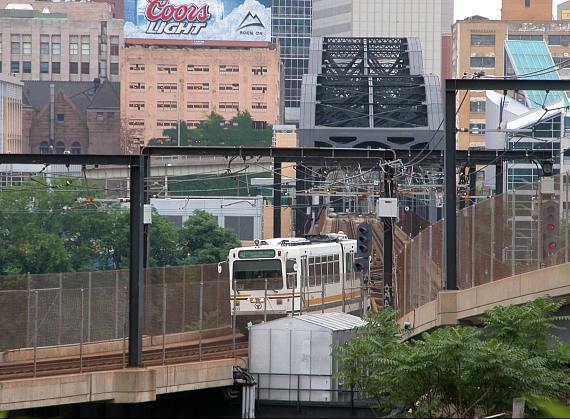 Metropolitan Pittsburgh's light rail network, known as the "T," is operated by the Port Authority of Allegheny County. The main part of the system consists of two routes which begin in a downtown subway, and then continue together south over the Monongahela River on the bridge pictured in this scene. After utilizing a transit tunnel under Mt. Washington the routes split apart at South Hills Junction into Overbrook and Beechview branches, only to rejoin for a stretch some miles later in Castle Shannon. After four further stops there is another split, to reach terminals at South Hills Village and Library. These pages about the Pittsburgh system are organized into seven sections. The first grouping deals with the "T" downtown out to South Hills Junction. The next sections deal with Beechview and Overbrook service. That is followed by pages on the joint running out to Washington Junction. The following sections are devoted to outer portions to the two terminals. Finally the series returns to look at the 52 Allentown line, a rather quirky line that offers part-time service traveling up and down city streets rather than through the Mt. Washington tunnel.